Duckweed is popping up here and there in my ponds. Woo hoo! Spring is FINALLY here! So far, I have harvested samples of Lemna turionifera, Spirodela polyrhiza turions and Wolffia. All are tucked nicely under gentle flourescent lights in warm temps and are acclimatizing to their new surroundings. It has been a struggle to keep my test samples warm enough in an unheated lab in an unheated warehouse so I fashioned a plastic “blanket” around and over said growing chamber and plugged in a space heater. I designed the plastic blanket sort of like a skort so I could gain access easier without losing all the heat every time I opening it up. Works great! I took the photo below with my cell phone and a 10x magnifying lens. It shows what newly emerged S. polyrhiza looks like before it begins budding. The Wolffia is so tiny, I didn’t even know it was there until I looked at it under a microscope. 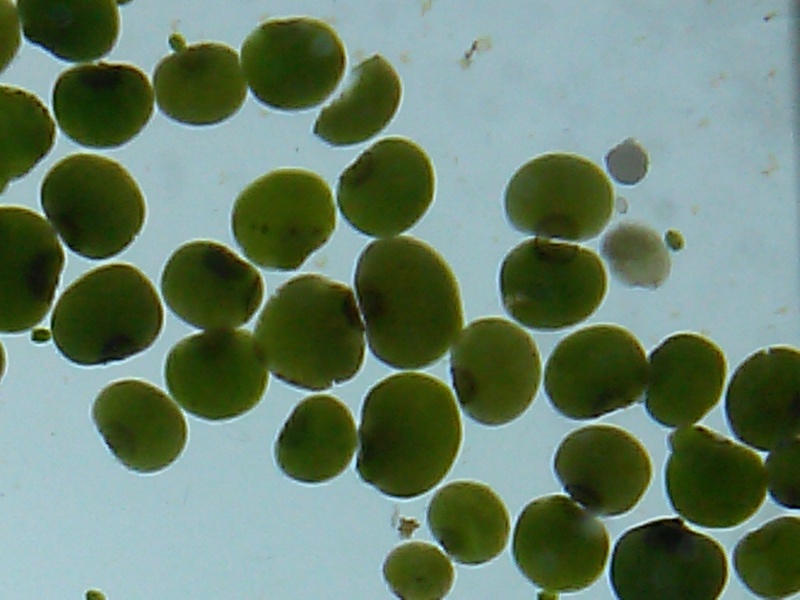 Wolffia- the world’s smallest flowering plant… Gotta love it. Great post! Looking forward to starting my own duckweed this Spring! Can’t wait!